Thomas Kasdorf is currently a Paul Collins Fellow, studying towards his DMA in Collaborative Piano at UW Madison, with Prof. Martha Fischer. He received both his undergraduate and Masters degrees from UW-Madison, where he studied with Prof. Fischer and Prof. Christopher Taylor. 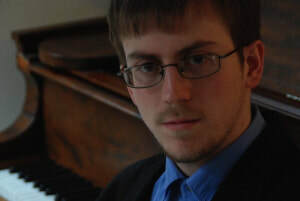 Thomas was an inaugural member of the prestigious Perlman Piano Trio, and has twice won the UW’s Irving Shain Woodwind and Piano Duo Competition. He has been on staff at UW-Madison as Opera Coach and is currently Artistic Director of Middleton Players Theatre and has served as their musical director for over ten years. Albany Records has recently released an album he contributed to, Seduccion, with flutist Stephanie Jutt.